IT'S OBAMA...now here are some bite sized appropiate reactions. McCain cheated on his wife at least once that we know of and probably many more times (if you listen to those who knew him during his first marriage). 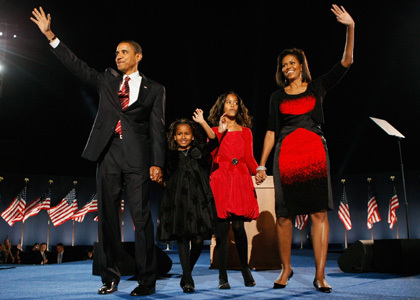 Obama has a beautiful family he has stayed faithful to. Stop saying Obama is the anti-Christian choice; you are embarrassing us. 1. Greenspan (a democrat) making an error in, as he said, "how the world worked," that got us into the credit crisis. 2. Having people like Michael Moore keep Bush in office by galvanizing the right. Thank you for keeping your mouth shut this time around. Kerry was doing fine in the polls until you made your stupid movie full of half truths and lies. A 300 + lbs man shouldn't be making a movie on health care, and a man who owned and profited off stock in Haliburton, while saying that stock investing and oil companies are evil, shouldn't be making movies about government corruption. Hopefully, you guys will no longer be used and abused as a distraction when there are issues out there that truly affect all of us (like our credit crisis or our 2 wars). However, please use this time to heed my previous advice. Next gay pride parade that any of you hold or participate in, try walking down the street in what you wear to work. Show your financial and societal impact. Grinding on each other in buttless chaps/drag to 80's music does not make me or most any sane person feel a kinship with you. He is smarter than you. Try and tell me that he is the exception to most black people, and I will take you to a NASCAR race so we can learn about white folks. Please shut up and go away. When you were crying and looking for the camera so they could see it, I was reminded that you have probably done more to divide races then unite them...and you never apologized for your behavior during the Duke LaCross Team scandal. Whether you like him or not, in what other country could any type of minority be ELECTED to office in a near landslide, especially 4 years after his polar opposite was there? We live in a great country, and my bet is that Obama is gonna be fantastic. Even if you don't agree, give him a chance. Heck, Bush got 8 years.